When it comes to power tool manufacturers, few companies have as strong a focus on innovation as Ryobi. It is not every day that a garden tool is powered by an engine designed by an automotive company, but for the RLM4617SME, this is true. This push-mower has a 175cc Subaru engine, providing plenty of power to get the job done. The Japanese automotive giant has more than 60 years of experience, and that is evident with this engine. It is as powerful as it is durable, and definitely one of the strongest selling points of the mower. We should also mention the versatile cutting mechanics. 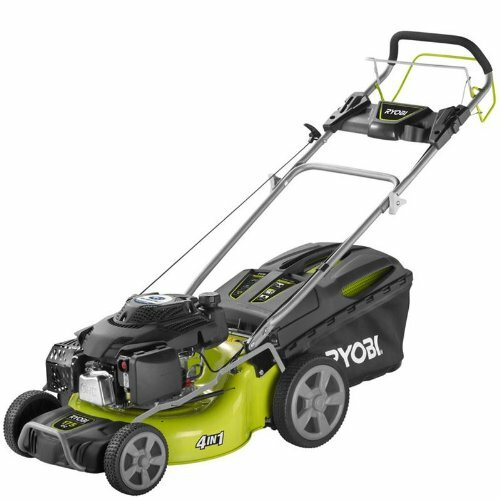 The Ryobi RLM46175SME has all the current cutting methods down to a T, including cutting, catching and mulching. The mulching function is supported by a side and a rear discharger, which is relatively rare. This allows you to recycle the mowed grass with great efficiency. The catcher bag is almost 2 cubic feet in capacity, providing plenty of space to mow down a medium-sized lawn without having to empty it half way. Thanks to the large rear wheels, this Subaru lawn mower is also easily maneuverable. You can choose between seven different cutting lengths ranging from 0.7 to 3 inches, and if you happen to get thirsty while using the Ryobi on a hot summer afternoon, you will love the cup holder. This Subaru lawn mower review would not be complete without mentioning the potential downsides. At about 77 pounds, the mower is a bit on the heavy side, and not as fast as some other mowers. The engine is still excellent and cuts the grass really well, so these are probably minor flaws rather than real problems. The excellent 175 cc Subaru engine is the strongest feature of the Ryobi RLM46175ME i. It makes the machine very powerful, and with the seven different cutting heights, the mower does an excellent job of cutting your lawn. If you are not worried about speed and more interested in getting the job done really well, this mower makes for an excellent choice.